Too many times, people fall into research as opposed to choosing it as a career path at an early stage of their student life. At B2B International, we like to take any opportunity that comes our way to try and change this. So, when we were asked to come and talk to Business Studies students at a local college about how to conduct market research, we gladly said yes. The hour-long session was very lively with lots of debate and discussions on a range of market research topics. Of particular interest to the students was around how large multi-national organisations rely on market research to feed into their future decision making and strategy planning. Focusing on real-world examples of market research in action really brought the subject to life, and sparked plenty of engagement among the students! 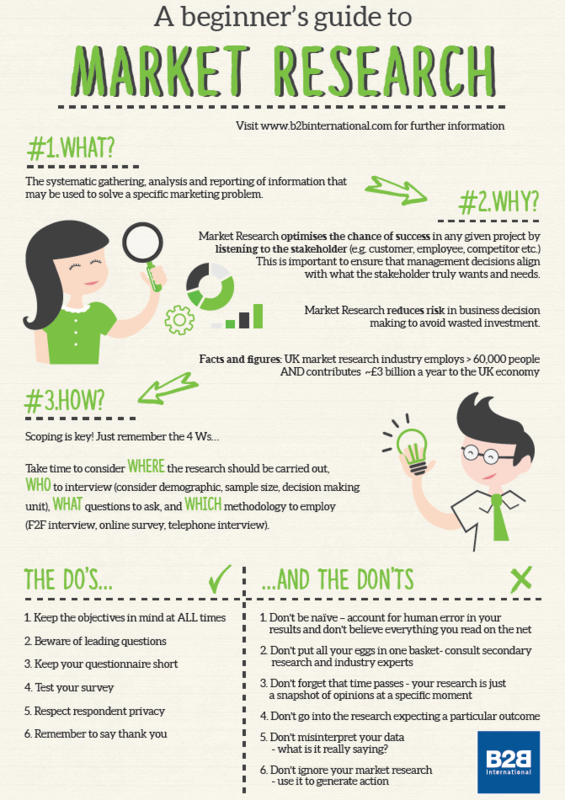 To help the students quickly and easily grasp what market research is about and the benefits it can deliver, we put together a ‘beginner’s guide to market research’ infographic. This handy guide outlined what research is used for and some do’s and don’ts when designing and using market research data. If you are thinking of carrying out or commissioning market research for the first time, it is well worth a look (below). If you have any further questions, we would be more than happy to talk to you.